Trevor is an accomplished musician himself and writes and records his own music. This painting shows the notes of the music being played disintegrating into coloured squares in the backdrop, from improvised harmony into a system. Trevor uses colour and tonality in vibrant formation to execute this unique concept. Complimentary colours are the primary dominations here with a overall blue feel to the background and a fractured orange on the figure. 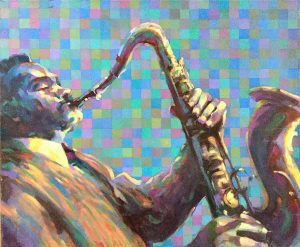 Movement is offset by tranquility in the composition and conveys the elements of jazz improvisation. This painting was included in the show ” That’s Jazz, Improvisations in Paint” and shown at the Cheltenham Jazz Festival, Town Hall, as well as The Gardens Gallery, Cheltenham.